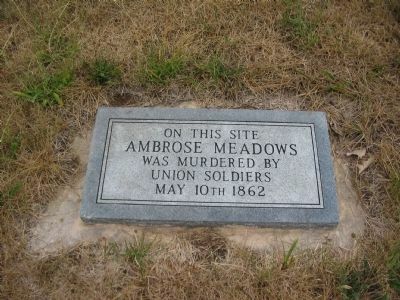 At this site on May 10th, 1862, following the battle of Mcdowell, union soldiers murdered Rev. Abrose Meadows. A mill and the Meadows home were burned, his wife and three children left homeless. Location. 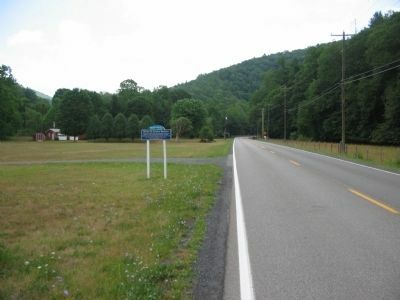 38° 40.317′ N, 79° 18.154′ W. Marker is near Franklin, West Virginia, in Pendleton County. Marker is on U.S. 33, on the right when traveling west. Touch for map. 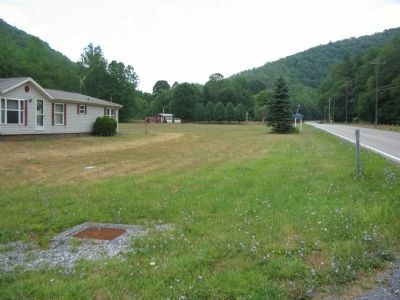 Marker is in this post office area: Franklin WV 26807, United States of America. Touch for directions. Other nearby markers. At least 8 other markers are within 6 miles of this marker, measured as the crow flies. Franklin (approx. 2.6 miles away); Pendleton County World War I Memorial (approx. 2.6 miles away); McCoy House (approx. 2.6 miles away); Organized Pendleton County (approx. 2.8 miles away); Devonian Shale (approx. 4.2 miles away); Confederate Prayer Service (approx. 4.4 miles away); Fort Seybert (approx. 4.9 miles away); Propst Lutheran Church (approx. 5.6 miles away). Touch for a list and map of all markers in Franklin. The stone was placed by the Sons of Confederate Veterans. The landmark stands in front of a private residence. More. 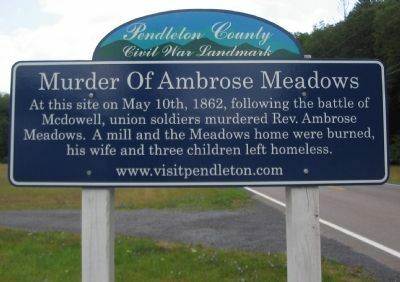 Search the internet for Murder of Ambrose Meadows. Credits. This page was last revised on June 16, 2016. This page originally submitted on August 15, 2010, by Craig Swain of Leesburg, Virginia. This page has been viewed 2,002 times since then and 67 times this year. Photos: 1, 2, 3, 4. submitted on August 15, 2010, by Craig Swain of Leesburg, Virginia.